So, that's the end of another academic year - one with its highs and its lows, but one I would say has been rewarding overall. I've also just listened to an interesting interview, between Radio 2's Jeremy Vine and musician Professor Green. I can't help thinking he could have easily been one of my students, working as a I do in a PRU and as I have done in support departments within mainstream schools. It turns out this interview is part of a wider series and I plan to come back to it, at least during the next month where spare time is more readily available. I actually think - for all the concerns over childcare, which for many are a real issue - most teachers, young people and their families do ultimately gain greater benefits from the summer holidays than simply not having to set an alarm. I think this is why the summer holidays have persisted since their original design, as a time for families to bring in the harvest. There may well be an argument for shortening them but I think we would all lose out if they were eroded away completely. So here's wishing colleagues and students a safe and happy sabbatical - I suppose, if you want to, you can consider the above your summer reading and listening! 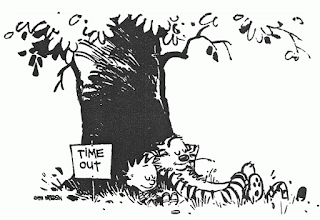 A snapshot from the iconic American daily cartoon series 'Calvin and Hobbes' - the creator Bill Watterson actively took sabbaticals to recharge before embarking on new,refreshed output.